In some ways today feels like one of confusion and contradiction. Our readings begin on “a colt that has never been ridden” and end “in a rock-hewn tomb where no one had ever been laid.” The disciples “praise God joyfully with a loud voice for all the deeds of power that they had seen.” “The chief priests, the leaders, and the people” … keep shouting, “Crucify, crucify him.” What began as a victory parade ends as a funeral procession. There’s a disconnect that makes us uncomfortable. It should. On the one hand we wave our palms and celebrate Jesus’ triumphal entry into Jerusalem. On the other hand the gospel paints a picture of Jesus’ passion and death. There’s a part of me that wants to say, “Well which is it? Palms or passion?” The answer is, “Yes.” Every year this day again reminds me, reminds us, that the answer is, “Yes.” It is both, palms and passion. The Book of Common Prayer even calls it that, “The Sunday of the Passion: Palm Sunday.” There is no quick or easy resolution to the palms and the passion. There is only the tension of the day. It’s a difficult place to be. Some say that the only reason we hear the passion story today is because people don’t go to church on Good Friday and today is the only opportunity for them to hear the passion story. I disagree. There is wisdom in hearing both stories together and it is in keeping with our sacred tradition. The reason we hear both stories is less about manipulation and more about the truth of our lives and world. Today’s liturgy presents the palms and the passion together because that’s the reality of our world, it’s the reality of our lives. Nearly fifty years ago we watched the dreams and hopes of a nation driving through the streets of Dallas end in the death of a president. Recall that ten years ago in one moment adventure, technology, and achievement were flying high. In the next moment the space shuttle disintegrates over the skies of Texas and the news headlines announced, “Columbia’s lost.” Next week we will celebrate and honor the life, work, and accomplishments of Martin Luther King, Jr. even as we grieve the 45th anniversary of his martyrdom. Palms and passion. The reality of palms and passion, triumph and suffering, touch us individually as well. It’s the joy of a newborn and the injustice of parents who outlive their child. It’s an active and successful career followed by a retirement of illness and disability. It’s the celebration of life and love in marriage and the pain and loneliness of divorce. It’s hard work and dedication that one day becomes unemployment and nothing to do. Palms and passion. Each one us here today can name our palms and our passion. We are both palm people and passion people because we are Jesus’ people. That’s just who and how Jesus is. It’s often not who and how we want to be. We want the palms, but the passion? Not so much. So we try to make our little world safe. We live overly guarded lives. For fear of what others will think or say we keep quiet when truth and justice seek a voice. Despite our deep longings and desires we say no to ourselves to avoid hearing someone else first say no to us. We tend to love and do for those whom we think will love and do for us. We hide who we really are to avoid another’s rejection or dislike. We insulate and isolate in an attempt to make ourselves invulnerable. I don’t see Jesus doing any of that today or any other day of his life. The gospels never describe Jesus as guarded, insulated, isolated. Every day he lived in the tension of the palms and the passion. He knew that it is not about choosing between life or death, palms or passion; but about choosing life and death, palms and passion. That’s the tension of this day. That tension is always a place of vulnerability. Vulnerability is at the heart of Jesus’ life and death. It is the water with which he washed the disciples’ feet. It is the supper he shared with Judas, the betrayer. It is the love by which he chose the cross. It is the waiting on God in the silence and darkness of the tomb. Vulnerability, however, is not simply about the circumstances. It is about authenticity and faithfulness. It’s about being real and fully alive. Jesus’ vulnerability gave him the freedom to live, love, and die. It is what makes him open and present to each of us, to the world, and ultimately to the power of God. Likewise, it is what makes us open and available to each other and to God in Christ. It’s what enables love and intimacy. It makes us real. It enlivens and makes holy our relationships. It is the path by which we follow Christ. Vulnerability was the gateway by which Jesus entered the mystery of this Holy Week and it is the gateway by which the mystery of this Holy Week will enter each one of us. So gather up your palms and your passions, your triumphs and your tragedies, your joys and your sorrows, your laughter and your tears. Leave nothing behind. Stand in the tension. Be vulnerable. Let your guard down. Risk it all. You have nothing to lose and everything to gain. This sermon is for The Sunday of the Passion: Palm Sunday, Year C. During the liturgy the story of Jesus’ triumphal entry into Jerusalem, Luke 19:28, and the story of his passion, Luke 22:14-23:46, are read. Thank Jill. I think we often misunderstand vulnerability as weakness or passivity. It is hard work to remain open and present to God and each other. I’m sorry we missed another Sunday service at St. Philip’s. I’m glad I was able to read your sermon. The last sentence got me and tears rolled, I will try and remember your words as we experience this Holy Week. Thank you Mike. Thanks, Kay, for your comment. We missed you Sunday. 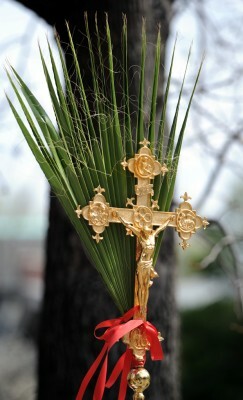 I hope you all are well and have blessed Holy Week.